Cold Dude Computers: EPF Message From Rookie September 20th! 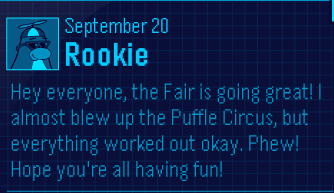 EPF Message From Rookie September 20th! Recently if you check you Spy Phones you will see that it is flashing blue! That means you have a new message! This one is from Rookie. "Hey everyone, the Fair is going great! I almost blew up the Puffle Circus, but everything worked out okay. Phew! Hope you're all having fun!" I am still wondering what's the worst that could happen at this party. What do you think's going to happen at this party, a disaster? Leave a comment and let us know!